Homemade chocolate buttercream frosting comes together easily and tastes so much better than the canned variety. I was a little late to the cupcake craze. But that’s okay. Still tastes just as good. My littlest one chose cupcakes for her birthday last week. The older kids were astounded: What do you mean? She’s not going to have a cake?! They are used to my themed birthday cakes. Still tastes just as good. My sister and the girls baked the cupcakes. I made the frosting. I’ve shared with you my Homemade Buttercream Frosting which is pretty awesome. The Girl wanted chocolate though. So, I did what any smart mama would do: I stuck to my old standby, but mixed in 1/2 cup of cocoa. Oh my. Heaven on a spoon. That stuff was pretty darn good. I’m so glad my girl requested chocolate! This chocolate buttercream comes together very easily — and it’s so much tastier than what comes in a can! Plus, it’s real food. It frosts about 18 cupcakes. Butter, cocoa powder, and sugar easily combine into a delicious chocolate buttercream frosting. In large mixing bowl, beat butter until fluffy. Add three cups sugar, cocoa powder, 1 tablespoon milk, and vanilla extract. Beat until combined and fluffy. Adjust with more sugar or milk, depending on what consistency you’re looking for. 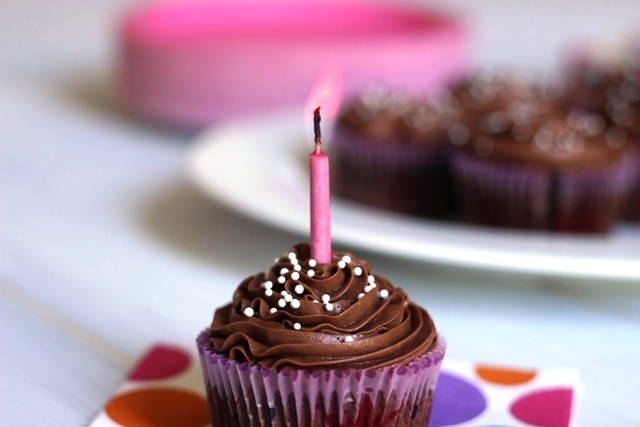 Want to make your cupcakes pretty? I’m a self-taught cake decorator. I never took a class (obviously), but through trial and error have figured out how to make it work. My kids are thrilled with the themed birthday cakes I’ve made over the years. Yum! Looks so good! I love making my own frosting. I have gotten to the point where I think the stuff out of the can tastes funny. This and your buttercream frosting are exactly what I grew up on. We always made our frosting and flavored it. I don’t even know if canned frosting existed when I was a kid as I never had it til I grew up. This is SO much better than canned. I miss my second child. She was my baking fiend. The third is kind of like my first(also all grown) and would just as soon not have to cook at all. My “baby”(he’s 14) loves cooking but he rushes so unlike my second more detail oriented kiddo I have to make sure I’ve got time to ensure he follows ALL the steps when we decide to bake. Would this frost a whole cake? Like a two layer cake from a 9 inch circular pan? Would I need to double up the recipe for that? If you want enough to do swirls and that kind of stuff, yes, I’d make more. Question: Can I frost a Buche de Noel cake with this? Yep. Make a double batch if you’re going to use it for filling. Have you seen my recipe? How much would you make to frost a 9 x 13″ cake? Is your original recipe enough for a 9 x 13″? I think you should be fine for that size. 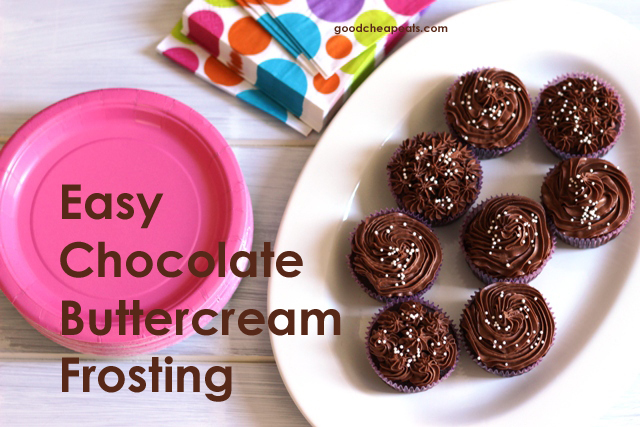 Hi – this is the best chocolate buttercream frosting, and SO easy to make. Thanks! One thing I will do next time is SIFT the confectioners sugar before mixing, to avoid the lumps. I have never had lumps. Bummer! This is now bookmarked. I halved the recipe and it covered 12 cupcakes with some frosting leftover. This is delicious and so SO easy to make! Glad you like it! Did you pipe your frosting or spread it? I find that the amount of cupcakes it covers varies depending on the method of frosting. I have an allergy to vanilla. Do I need that for the frosting? Nope. You could omit it or use a different flavored extract like mint, coffee, or orange. How many cupcakes will these cover if I use the piping method? I think I made 18 this way? Hi I’m just wondering do you have to use coca powder for this recipe? Could you use melted chocolate? If so how much melted chocolate would you add? I’ve never used anything but cocoa powder, so I can’t give you a good answer. I know there are recipes out there that use melted chocolate, but that’s not a method I’m familiar with. Sorry I can’t be more help. May I know if you used salted.or unsalted and how is is one cup in grams? I just piped 24, although I didn’t make a very thick layer, just circular swirls. Tastes great! Thanks for the simple recipe! I really don’t want to make a frosting with melted chocolate, this is the closest recipe that I’ve found that my Mom made[back in the day…] Thanks!!! Does this frosting keep in the refrigerator overnight? Thanks for posting! I have stored leftovers in the fridge, but it gets really hard. You’ll need to allow it to warm/soften before it will be spreadable again. Thank you! I’m bringing it to school tomorrow so I wanted it to keep overnight. I’ll plan on leaving it out for a while before spreading it on the cupcakes. That awkward moment when you realize the recipe called for 3 to 4 cups of powered sugar, NOT 3/4 cup powered sugar. Derp. Oop! Did you have enough on hand? I was so close to saying this recipe was bad but… I forgot to add the powdered sugar. And it’s SOOOOO good! I’m fairly new at making home made frostings. I’m pleased to say that this came out tasting very good. Because my son likes orange, I added orange extract and a teaspoon of orange zest to the recipe for his birthday cake. I just have a question. The frosting color came out looking like milk chocolate. I would have preferred a darker color. For future reference, what would I need to do to make the frosting more of a dark chocolate color? I’m going to guess that it may have to do with the cocoa powder. My sister buys the dark cocoa powder and that makes a darker frosting. Ahh! I’ll make sure to pick that up next time. Thanks! Hi I loved the recipie. What cakes would you suggest using this with and can you use it as a filling? Any cake you like, and yes, it works as a cake filling as well. Can u use this to decorate roses? Will the shape hold? Trying to make a rose cake with not as much sugar. You mean to pipe roses? I think if it’s cold enough and has enough sugar, it should be fine. But, a hot day is a hard call. Can I use water instead of milk? I have never done that, so I do not know. Can I use chocolate frosting on a cookies? Can you use skim milk? Yes, just use less to start. Add more only if it needs it. I had to make frosting on the fly after I found the can I bought had been “taste tested” in the store. It was the best thing that could’ve happened though! The recipe is perfect. I sifted my sugar & cocoa too. I found I made the most delicious tasting stuff I’ve had since I was a kid. I’ll never use stkore bought ever gain THANKS! Yay! What a happy accident! Delicious!!! Just the right combination of ingredients. I could have eaten the whole bowl of it by itself. What cake!? LOL! Definitely going in with favorite recipes. Ha! I totally get you. It’s heaven on a spoon. hello, did you use sweetened or unsweetened cocoa powder? All I have is unsweetened, or I have hot chocolate mix. Just wondering what you think? Thank you! can I substitute water for milk when making frosting? I would not recommend it because I’ve never tried that in this recipe. This turned out delicious. I have used it a few times and this last modified it a bit. I added orange zest and instead of milk I added orange juice. It tasted just like a chocolate orange! I used this recipe to pipe frost 16 cupcakes. It covered them but bare minimum, using 3C of powder sugar. Any more sugar and I think the frosting might have been ruined as it was quite dry and gummy even with the addition of 3T of milk. I would also suggest sifting the powder sugar as it was lumpy. Mix by hand first before using electric mixer as it makes a huge sugar dust cloud that even with a deep bowl, bursts up and outwards. Can you store a frosted cake with this frosting at room temperature, or does it have to be refrigerated? Depends on how long and how hot it is. I don’t recommend it for the middle of summer, but just as it’s okay to have butter at room temperature for a time, this will be fine for a few hours. Thanks for the reply! Is this different than regular buttercream frostings then? I’ve read that those can be kept at room temperature for several days. Well, room temperature in summer is different than room temp in winter. You know? I’ve read conflicting information about how long buttercream is good sitting out. I’ve never tested it past a day in a cooler kitchen. Hey Jessica…how much do we need for 72 cupcakes? With fancy tops? Probably 4x the recipe. But, it’s easy to make more in the same bowl, so I’d underestimate and then make another batch if you need more. 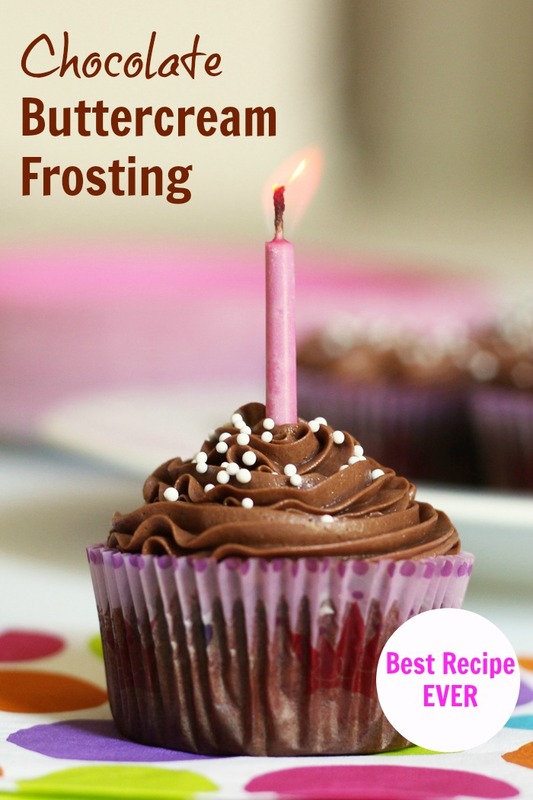 Can this frosting be kept at room temperature for a day or to? On a cake, yes, but not on a hot day.